Latherz bathing sponges bring relief to residents, allow bathing with little water use. A donation from a local small business has hard-hit residents of Flint, MI breathing a sigh of relief for the first time in months. The product, Latherz bathing sponges, allows one to wash and clean their entire body with just 3-4 ounces of water, a boon to Flint parents who are still wary of bathing their young children in the lead-poisoned water. 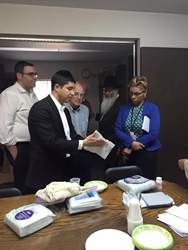 The distribution of thousands of Latherz sponges took place at the Flint Jewish Federation on Wednesday, May 11th. The Latherz dry sponges contain soap just under the surface. Pouring just a couple of ounces of water on a Latherz sponge and then rubbing it together allows the soap and shampoo to rise to the surface with enough solution to wash an entire adult body. It doesn’t take any water to wash off the soap and shampoo; a thorough rub down with a towel is all it takes to leave one with a clean feeling. Flint resident Jessica Gutierrez was the driving force behind last week’s distribution, as well as an earlier donation of thousands of Latherz sponges to the local WIC office by Mars Wellness. The mother of five was looking for a way to clean her young children while at the same time avoiding the water that is especially dangerous to children, and had already caused a skin condition on one of her daughters. She found Latherz online and in her review of the product raved how helpful it was to her and her family dealing with the Flint water crisis. Enough bottled water is available to the residents, Gutierrez wrote, what they need is a way to bathe and clean the children. Picking up on the review the company reached out to Ms. Gutierrez who put them in touch with local organizations and the local NBC affiliate to help spread word of the product. The Latherz sponges were originally developed for use with geriatric and immobile patients, where getting them to a bath or shower is difficult. It has since gained traction with campers, hikers and pet owners, as well as in developing areas where running water is scarce. This distribution was held in conjunction with Chabad of Eastern Michigan, the Flint Jewish Federation, the United Way of Genesee County and the Food Bank of Eastern Michigan.